Rozumovsky [Розумовський; Rozumovs’kyj]. A Ukrainian family of Russian imperial counts and military and civic figures from the Chernihiv region. Yakiv Rozum and his son, Hryhorii (d ca 1730), were registered Cossacks in Kozelets company, Kyiv regiment. 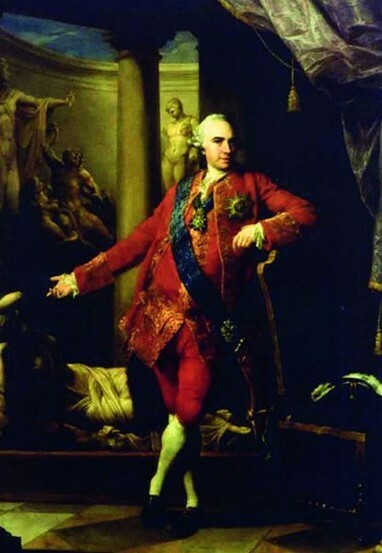 Hryhorii's son, Oleksii (Aleksei, b 28 March 1709 in Lemeshi, Kozelets company, d 17 July 1771 in Saint Petersburg), was brought to Saint Petersburg to sing in the imperial court choir in 1731. There he soon became a favorite of Empress Elizabeth I, who granted him and his family many estates, secretly married him (1742), and appointed him a count (1744) and field marshal (1756). Oleksii was the first to use the name Rozumovsky. Under his influence things Ukrainian became fashionable at Elizabeth's court. He persuaded Elizabeth to restore the office of hetman in Ukraine and to appoint his brother, Kyrylo Rozumovsky, to that position in 1750. 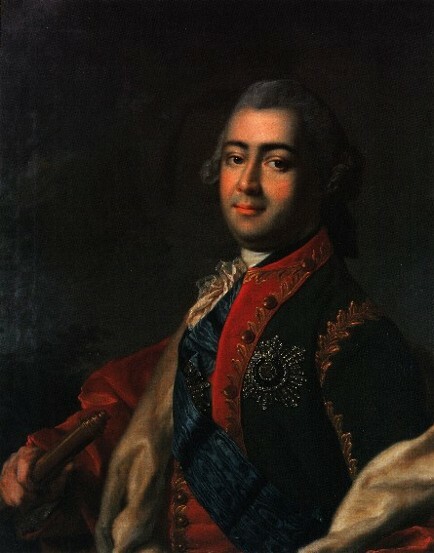 Kyrylo appointed his brother Petro (d 1771) colonel of Nizhyn regiment (1753–71) and his brother Vasyl colonel of Hadiach regiment (1755–62). Kyrylo Rozumovsky was married to Countess K. Naryshkina, with whom he had six sons and five daughters. The eldest son, Oleksii (Aleksei, b 23 September 1748, d 17 April 1822 in Pochep, Mglin county, Chernihiv gubernia), was appointed a privy councillor and senator in 1786, trustee of Moscow University in 1807, and imperial minister of education (1810–16). As minister of education he oversaw the creation of more parish and county elementary schools and gymnasiums (eg, in Kyiv, Nizhyn, and Kharkiv) and the improvement of teaching methods and school inspection. Oleksii had an abiding interest in the natural sciences. He created a large botanical garden with over 2,000 different plants and 500 orange trees on his estate in Gorenki, near Moscow, and amassed the largest private natural-science library in the Russian Empire. He was a mystic, a Freemason, and the vice-president of the Russian Bible Society. Oleksii's marriage to Countess Varvara Sheremeteva produced two sons and two daughters. He also had 10 illegitimate children, who received the surname Perovsky. 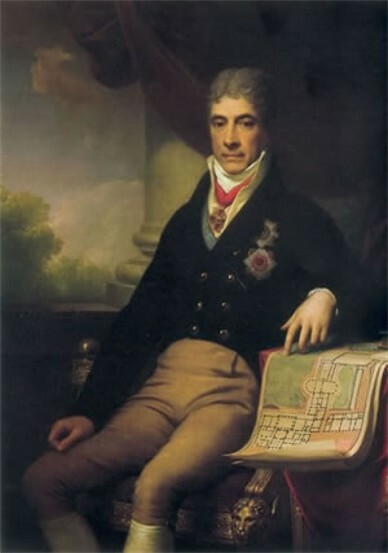 Oleksii's older son, Petro (Petr, 1775–1835), was a major general (1799–1801) and served as a state counselor to the governor of New Russia in Odesa from 1806. He was the last count of the Rozumovsky family in the Russian Empire. Petro's younger brother, Kyrylo (Kirill, 1777–1829), died insane in Kharkiv. Hetman Kyrylo Rozumovsky's second son, Petro (Petr, b 26 January 1751, d 26 December 1823), was a general in the Russian army and then a senator and privy councilor. The hetman's third son was Andrii Rozumovsky. His fourth son, Lev (b 19 January 1757, d 3 December 1818), received the rank of major general in 1790. The hetman's sixth son, Ivan (b 17 August 1761, d 1802 in Italy), served as an adjutant general to his father from 1784 and was a colonel in the Little Russian Regiment from 1789. He retired in 1796 with the rank of major general. Kyrylo Rozumovsky's fifth son, Hryhorii (Grigorii or Gregor, b 21 November 1759, d 3 June 1837 in Český Rudolec, Moravia), studied mineralogy and geology in Leiden and lived in the 1780s in Lausanne, where he published the mineralogical studies Ouevres de M. le comte Grégoire Razoumowsky (2 vols, 1784) and Histoire naturelle de Jorat et de ses environs ... (2 vols, 1789). In 1790 he was elected an honorary member of the Russian Imperial Academy of Sciences. In 1816 he published Coup d'oeil géognostique sur le Nord de l'Europe général et en Russie en particulier. After the death in 1818 of his second wife, Baroness Teresa-Elizabeth Schenk de Castel, Hryhorii and his sons Maximilian and Lev left Saint Petersburg forever, became Austrian citizens, converted to Protestantism, and lived near Vienna, in Baden bei Wien, and on their estate in Český Rudolec. They and Lev's heirs were recognized as the Austrian counts Rasumofsky. In Silesia Hryhorii discovered a new mineral that became known as Razoumowskin. He was elected a member of the royal academies of sciences in Stockholm, Turin, and Munich and of several scientific societies. Lev's son, Leo (d 28 March 1915), served in the Austrian embassy in Paris and funded the restoration of the hetman's palace in Baturyn, the tomb of the Rozumovsky family there, and churches the construction of which had been financed by Hetman Kyrylo Rozumovsky.